Rekabentuk, pembangunan, pemerolehan, penyimpanan, pengedaran, penyelenggaraan, pemindahan, dan pelupusan materiel. Pengambilalihan atau pembinaan, penyelenggaraan, operasi, dan pelupusan fasiliti. Sokongan perkhidmatan perubatan dan kesihatan. ^ AAP-6 2009, NATO Glossary of Terms and Definitions. Dupuy, R. Ernest; Trevor N. Dupuy (1970). The Encyclopedia of Military History (edisi revised). New York: Harper & Row. ISBN 0-06-011139-9. Eccles, Henry E. (1959). 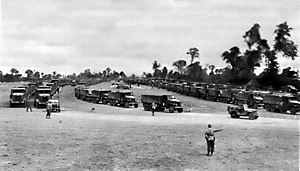 Logistics in the National Defense. Harrisburg, Penn. : Stackpole Company. ISBN 0-313-22716-0. Kress, Moshe (2002). Operational Logistics: The Art and Science of Sustaining Military Operations. Kluwer Academic Publishers. ISBN 1-4020-7084-5. Huston, James A. (1966). The Sinews of War: Army Logistics, 1775–1953. United States Army. 755 pages. Ohl, John Kennedy (1994). Supplying the Troops: General Somervell and American Logistics in World War II. DeKalb, Illinois: Northern Illinois Press. ISBN 0-87580-185-4. Biography of Brehon B. Somervell, head of the United States Army's Army Service Forces during World War II. Prebilič, Vladimir. "Theoretical aspects of military logistics". Defense and Security Analysis, June 2006, Vol. 22 Issue 2, pp 159–177. Thorpe, George C. (1917). Pure Logistics: The Science of War Preparation. Kansas City, Mo. : Franklin Hudson Pub. Co. OCLC 6109722. Thorpe, George C. (1986) . George C. Thorpe's Pure Logistics: The Science of War Preparation. Stanley L. Falk (introduction). Washington, D.C.: National Defense University Press. Thorpe, George C. (1997) . George C. Thorpe's Pure Logistics: The Science of War Preparation. Newport, R.I.: Naval War College Press. Thorpe, George C. (2002) . Pure Logistics: The Science of War Preparation. Honolulu, Hawaii: University Press of the Pacific. ISBN 0-89875-732-0. Laman ini diubah buat kali terakhir pada 15:17, 18 Ogos 2017.